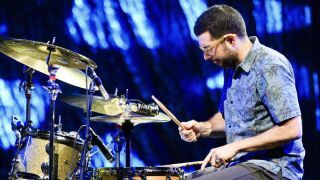 David Bowie thought so highly of Mark Guiliana that he recruited the American sideman and bandleader to track drums on his final album, Blackstar. Here, the highly-regarded jazzer gets behind the kit and answers our key questions. I really enjoy the challenge of sitting down at a new instrument, a new-to-me kit and then trying to make my own statement in a new or uncomfortable environment. “The sarcastic answer I could give this would be nothing, in the sense that I really enjoy the challenge of sitting down at a new instrument, a new-to-me kit and then trying to make my own statement in a new or uncomfortable environment. That helps to keep me on my toes and keep me in the moment, present and truly trying to make decisions that are appropriate for that moment on that specific instrument. “But, if I had to choose one thing there is this cymbal that I love. It’s a 23” Sabian cymbal and it is essentially a prototype. I was up at the Sabian factory a few years ago and this cymbal was sat there unlabelled and dusty and I kept walking past it and playing it. “This might sound a little ignorant, but for me what can really go wrong on stage? Nothing can go wrong. Maybe I can say that because I’m often involved in creative environments where things going wrong leads to new, exciting musical choices. If you’re playing to tracks in an arena then things can go wrong but I don’t have personal experience in that world. My goal is to be at my best every time that I am playing music. I try to live in a way to put myself in the best position that I can to play my best. “John Coltrane - but that one’s not gonna happen. My first ten answers to this would probably be non-drummers and my next ten would probably be drummers who are not with us anymore. “I’d like to say consistency and reliability. My goal is to be at my best every time that I am playing music. I try to live in a way to put myself in the best position that I can to play my best. Specifically when you’re on the road, there are many elements that take you out of being your best. That might be waking up early and then taking a flight and there’s traffic, bad weather, there’s all of these different ways of being tired or underfed or whatever. "I’m always trying to take care of myself and put myself in that best position and therefore trying to be in the moment and give the music everything that I have every single time. That’s what attracts me to the other musicians that I choose to play with as well, specifically in my band where I get to hire the musicians. "Consistency is one of the first qualities that I look for, and it’s not even the consistent of ‘playing well’, it’s the consistency of emotional output and the commitment to the music and to each other. I try to lead by example on that. “I’m not sure of exactly which song it was, but I do remember early on Green Day were huge right around the time I started playing, I guess they still are huge. I was trying to learn a few of their songs, so it might have been something by Green Day as well as some songs from Nirvana’s Unplugged album.